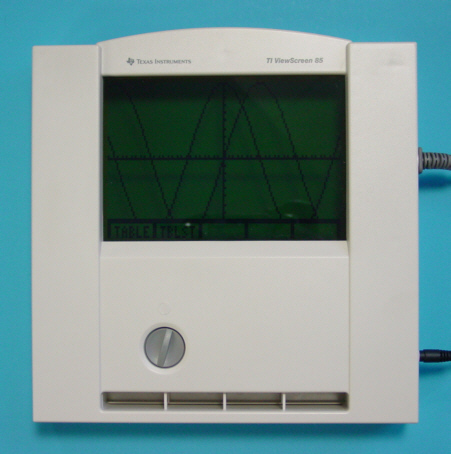 The TI ViewScreen 85 was introduced in 1994 and connects to the second generation TI-85 VSC (ViewScreen Calculator) and the TI-86 VSC. It was delivered either as the ViewScreen panel package with the power supply and a carrying case or as part of the ViewScreen system including the Graphing calculator. The first generation of the TI-85 VSC was permanently connectred to a much smaller ViewScreen panel. Dismantling the TI ViewScreen 85 reveals no surprises. A huge, transmissive LCD panel is connected to three display drivers already known from the TI-81. The arrangement of two Toshiba T6A39A column drivers and one T6A40 row drivers found in the TI ViewScreen 85 is obvious from the layout of the printed circuit board (PCB). © Joerg Woerner, September 5, 2007. No reprints without written permission.